Great Impressions: Happy New Year! Welcome to the new year at Great Impressions Stamps! With the new year there are always changes, some sad some happy. also their wonderful passion and enthusiasm for Great Impressions Stamps! Please take the time to wish them the best on their new endeavors! Great Impressions Blog! Starting with our new challenge on Sunday, Cheryl will be joining us. out of her. To top if off she is super sweet! I am so thrilled to have her! Joining us for the month of January, as our Guest Designer, is Patti. you are sure to find Patti. A heart of gold and ubber talented to boot! My card today celebrates the birth of a New Year! May it bring you peace, health and happiness! What a beautiful colorful card. Love the papers you used with the sentiment stamp, Jenny! Jenny... what a fantastic card! Love the banner you created! xoxo Erin. I love the tag with the flower at the tip! Cute as can be, Jenny! Those pretty colors make me happy! Lovin' the banner too! 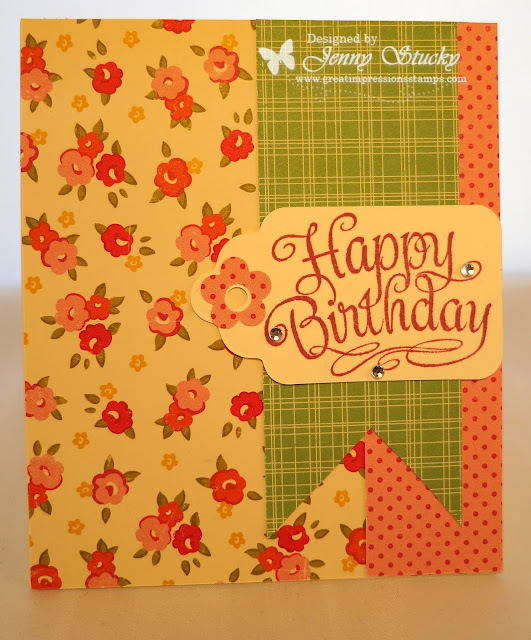 Great card - thanks for sharing! Lovely card. That little flower on the tag hole is cute. This is sure to be a great card to CAS. Thanks for sharing. Such a wonderful CAS card! I love the cheery colors.